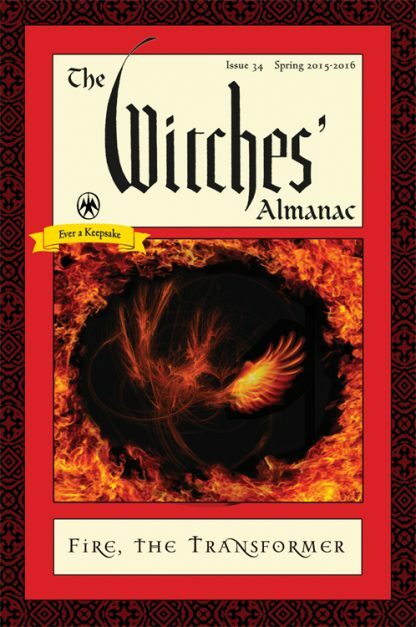 Founded in 1971 by Elizabeth Pepper, the art director of Gourmet magazine for many years, The Witches' Almanac is a witty, literate, and sophisticated publication that appeals to general readers as well as hard-core Wiccans. At one level, it is a pop reference that will fascinate anyone interested in folklore, mythology, and culture, but at another, it is the most sophisticated and wide-ranging annual guide for the Wiccan enthusiast. Modeled after the Old Farmers� Almanac, it includes information related to the annual Moon Calendar (weather forecasts and horoscopes), as well as legends, rituals, herbal secrets, interviews, mystic incantations, interviews, and many a curious tale of good and evil. Although it is an annual publication, only about 15 percent of the content is specific to the date range of each issue. The theme of Issue 34 (Spring 2015�Spring 2016) is Fire the Transformer, and among our lineup of obscurities is the Krampus, a Wassail recipe, Botanicas, the Restless Dead, Rum, and the Tibetan Dorje.